Get an introduction to the famed beaches of Los Angeles, from Santa Monica to Venice Beach, on this 3-hour tour. Choose a morning or afternoon departure, and travel by comfortable minivan, hopping out to explore each destination on foot with a guide. Sights include Santa Monica Pier and the Third Street Promenade; Venice Beach Boardwalk and its Muscle Beach; and the affluent seaside communities of Marina del Rey and the Pacific Palisades. Meet your guide and group in central Los Angeles to begin your 3-hour tour of the city’s world-famous beaches. Aboard a comfortable, air-conditioned minivan, travel to Santa Monica, whose century-old pier marks the terminus of the old Route 66. As you set foot on Santa Monica Pier, hear about the history of the amusement rides from your guide. Then stroll down the Third Street Promenade, an open-air shopping district filled with boutiques and name-brand stores in downtown Santa Monica. Back aboard your vehicle, drive to another waterfront gem: the Venice Beach Boardwalk. See the Pacific Ocean glittering before your eyes, and marvel at the street performers and eccentric denizens of Muscle Beach as you meander past quirky shops and other offbeat haunts. Listen as your guide regales you with stories about former inhabitants like Jim Morrison, who lived here during the beginning of Venice’s counter-culture heyday. 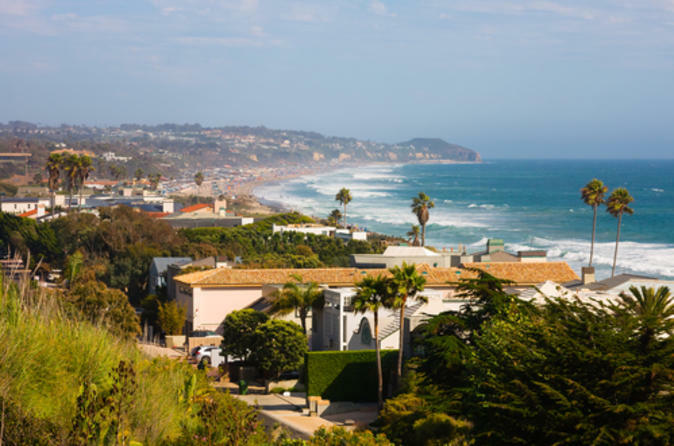 Enjoy more ocean views from Marina del Rey, resplendent with colorful boats and scenic waterways, and pass through the upscale seaside enclave of Pacific Palisades before your tour ends back at the starting point.